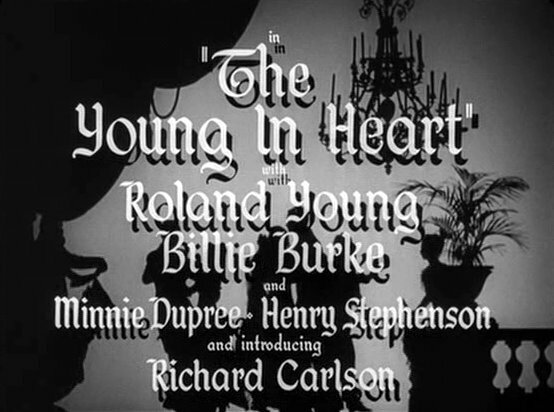 The Young In Heart stars Janet Gaynor, Douglas Fairbanks Jr., Paulette Goddard, Billie Burke, and Roland Young. I saw the last half of this movie several months ago but now got to watch the whole thing. I highly recommend this movie. It is about a family of con artists who are in a slump, having been found out and ousted from the French Riviera. On the train to London they meet a lonely old lady named Miss Fortune who invites them to stay at her house. They hatch a scheme to have Miss Fortune write them into her will, so they use their well-honed skills of deception to pretend to be an honest hard-working family. In the process they find success and happiness. This movie unfolds very well. The pacing and the dialog are understated but charming. The performances are top notch. This one just makes you smile.